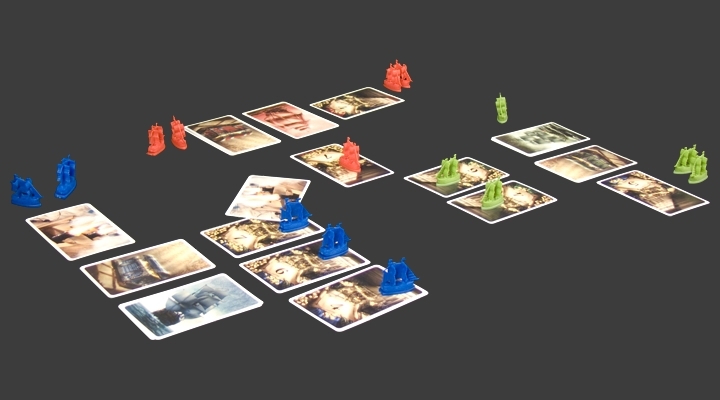 Letter of Marque is a very light and quick bluffing game with players launching ships laden with treasure and hoping they reach port safely whilst trying to steal other player’s treasure. Each player starts with 5 ships, 5 treasure cards and 3 cannon cards. Two of the ships have cannons marked on their undersides (these are defended ships) and the other three are blank (which are undefended). The treasure cards are numbered 3, 4, 5, 6 and 7.